A place which wants to attract the most discerning souls, should be unique and embody a complete lifestyle concept which combines a relaxed, holistic approach amongst an elegant setting and decor with attention to detail. This includes, clean, updated and attractive guest rooms with no amenities spared. Pleasing food & beverage prepared and presented with pizzazz are complemented by soothing music which is also an integral part of the ambiance. The attractive, smiling and well-mannered staff is dressed stylishly. All of these elements combined will, undoubtedly, seduce the senses and generate good vibes along with positive memories created. However, is all that adequate? Today, more than any other time in history, customers are the most sophisticated and increasingly demanding – whether they’re Boomers, GenXer’s or Millennials. The total customer experience in the high-end hospitality domain requires superlative attention to customer care from the moment a booking is made, during the guest’s stay and beyond. The use of an integrated approach is essential across various touch points with the purpose of engaging and retaining customers. Astute guests consider hotels they choose to be an upgrade away from home in terms of comfort and services offered. One area of particular attention in the last few years has been the bed. It has been the focus of tremendous improvement. According to J. D. Power & Associates, a comfortable bed and pillow choices are must-haves ‒ especially for business travelers. In fact, 93% of luxury hotels offer a selection of pillows. A high-end resort developer and operator, Kerzner International, renowned for its opulent One & Only luxury resorts brand has “Blow away the customer” as it core mantra. The company walks the talk by impressing its guests through grandiose entrances, facilities, overall ambiance and luxury amenities – then making absolutely certain that they are pampered throughout their stay. It’s all an integrated, well-orchestrated and flattering process. Nothing is left to chance although it does take a coordinated team effort to make it all happen flawlessly. – Want to feel in command of their purchase decision without any pressure. “Boutique hotel” is a term to describe hotels which often contain luxury facilities of varying size in unique or intimate settings with full service accommodations. Sometimes known as “design hotels” or “lifestyle hotels”, boutique hotels began appearing in the 1980s in major cities across North America and Europe – mainly in the U.K. These hospitality properties are characteristically furnished in a themed, stylish and unique manner. Boutique hotels generally are known to have less than 100 rooms. Their limited capacity enables them to enhance the customer experience through personalized service, as well as to customize their property and operations. An intimate atmosphere is usually regarded as a vital part of a “boutique” hotel. This includes cozier premises, quality amenities; conceptual dining outlets that become destinations in their own right, and an environment whereby the hotel staff recognize what your needs and desires are, rather than just responding to what you ask. 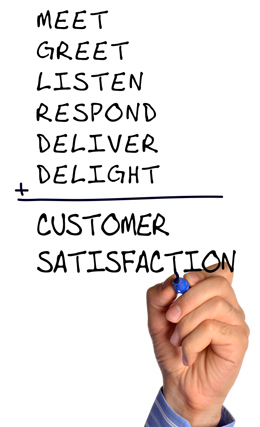 Superb customer experience isn’t merely offering the customer what he/she asks for but rather what the discriminating customer truly desires to receive. This is accomplished by constantly exceeding of expectations through the delivery of remarkable tailored customer service with a series of personal touches. Premium and luxury hotel guests expect surprise and delight along with unusual positive experiences. Forrester, an independent technology and market research company, defines customer experience as: How customers perceive their interactions with your company. As with brands, customer experience is not what management thinks it should be – it’s what the customer perceives it to be. Thus, it should be understood that, because experience is a customer’s perception, management doesn’t control the customer experience, but it can certainly influence it. The challenge for hospitality organizations is to ensure that their personnel always provide at least the level of service that their guests want and expect every time, perfectly. The purpose of quality management in the hospitality industry is to ensure that customer service is consistent and flawless. Providing it is intertwined with the overspill of the needs and expectations of guests and therefore their enthusiasm (delighted guests). The element of quality of service offered by the hotel industry should be apparent, be recognized and understood by the guest, as absolutely essential element in all the stages and processes during the service delivery. The organization’s strategy, personnel and systems are aligned to meet or exceed the guest’s expectations regarding the following aspects of the guest experience: service product, service setting and service delivery. These aspects are carefully woven together to give guests what they desire and expect, plus the wow element. It all starts with the guest. Evidently, you can’t have a guest experience without a guest to experience it. That’s the main point, without the guest to initiate it, the components such as the carefully designed service product, the detailed and inviting setting, the highly trained and motivated servers and the finest back of the house people and facilities are just an experience waiting to happen. The evaluation of service quality is a complex process, and the guest side is primarily subjective criteria, because each person can have their own opinion. But what is it really imparts excellence in quality of service to guests and causes only positive emotions and reactions of customers when they experience an unforgettable experience? When these four elements, coexist and perform maximally, then the chances, the qualitative result to delight the guests, are significantly increased. The service, as a product of person to person or a series of interactions between the guest and the person delivering the service is transformed into experience for the guest. The positive or negative aspect of the experience depends on the strategy applied by each company and sets the service delivery system. The guests, the service procedures and physical data sited so as to form a quality experience for the customer service they receive. Employees, who are also the brand ambassadors, play a crucial role in the process of service delivery. They are trained specifically for this purpose and supported by the organization itself along with the organizational culture. Technology and information flows like internal and external communication.Artificial and natural elements of the service along with the human factor, in this case, define the guest experience. Reliability reflects the service provider’s ability to perform service dependably and accurately. Responsiveness is a strong indicator in assisting guests and providing prompt service. Reassurance reflects the courtesy and knowledge of employees and their ability to inspire trust and confidence. Empathy involves the caring individualized attention the brand provides its guests. Tangible elements include the facilities, amenities and ambiance felt by the guest directly or indirectly. A company’s reputation for excellence in the services sector can be developed and supported, as long as the firm has a strong organizational culture oriented in high quality service, customer focus throughout the organization, as well as a dynamic set of employees. They are conscientious and committed to act within the quality standards which the company has established. Develop and install appropriate infrastructure service delivery system. Identify the necessary procedures to recognize and meet the needs and expectations of guests. Refine and encourage staff to speak with the right attitudes, skills and behaviors to internal and external environment of the company and towards the guests. Measure – evaluate the degree of guest satisfaction. Continuously implement practices to improve internal operations and procedures relating to excellent guest service. An experience is created when a company uses the services and goods, in such a way as to create a memorable event and to stimulate the emotional world of the guests.The more intense is the intensity of emotion, the more strongly imprinted in memory and then only is it created as a memorable experience. Guest experience is an integral part of service excellence and absolute customer satisfaction, all of which are subject to evaluation and performance measurement of an organization. With modern techniques and methods identified and assessed the degree of customer satisfaction and the recorded positive or negative experience. The collection of information, both during the service and the configuration of the customer experience provides useful information and enables the company to rectify and remedy any failure or deviation from the quality standards prescribed. Customer service centric hospitality businesses train staff to utilize the so called “sixth sense:” It’s the innate ability to perceive what is not seen or immediately apparent. That perception will undoubtedly offer hotels, as well as other customer driven businesses, to delight their customers. According to an article authored by Mike Metcalfe, founder of Hoteliyo, a resource and blog for hotel professionals, he suggests to define your hotel service culture. Start by creating the ‘Guest Journey’. 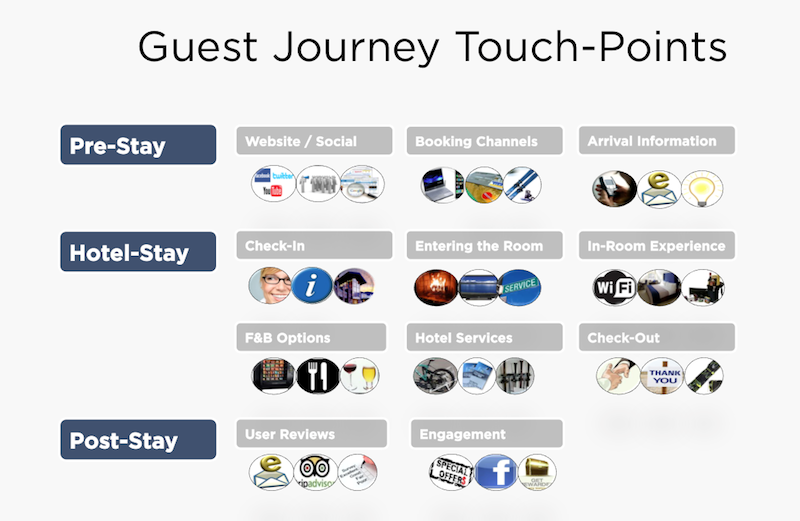 Map out every interaction or ‘touch point’ guests will experience as the following image depicts. 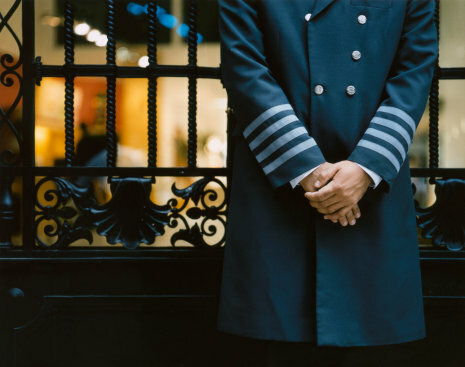 At Ritz-Carlton hotels, employees with direct contact with guests, such as the bellmen, are authorized to spend as much as $3000 to help solve a customer’s problem. At some other luxury hotels a wake-up call from the employee is not a typical, “This is your wake-up call ‒ wish you a great day”, but it also includes an offer to send up a complementary cup of coffee to get the guest’s day started. At a Four Seasons Boston hotel video, an employee describes with pride and exhilaration how she went out of her way to personally get a guest’s luggage to the airport at the nick of time. The luggage was locked in the trunk of the customer’s rental car parked at the hotel and had lost his keys. Meantime, he had to rush to the airport without them so as not to miss his international flight. Nowadays, luxury hotels should not neglect utilizing the benefits of IT and the internet to keep a two-way flow of continuous communication with its prospective, as well as existing clientele. This includes a fully integrated CRM system which connects sales, marketing and the administration including reservations, monitoring and respond­ing to review sites and reaching out to social networking sites. Customer preferences are also kept on record to keep in consideration and deliver upon during the guest’s future stays. Digital think tank L2 reported 78% of the affluent participate in social networking sites, with more than half using social media to connect with a brand, while 65% of wealthy consumers believe that brands that have no such presence are considered out of touch. Luxury hotel chain Four Seasons, only a couple of years ago, unveiled a new website that reportedly cost a whopping $18 million to develop. It uses a holistic digital media strategy to enhance the total online experience and give a visual taste of what can be anticipated at their properties. Extensive research around digital consumption of luxury consumers, both in the travel sector and across other categories, was conducted for the development of the new website. The result of the investment is a fancy, colorful website, with a new booking process, social media integration and personal profile technology that allows users to set preferences and create a more targeted online experience. It is also optimized for mobile, which provides access to a reduced size version of the site, and includes videos, room rates and booking capabilities. In addition, locations and experiences are showcased through photo-rich, informative property and destination pages. Upscale hotels, particularly, must offer WiFi access throughout the property at no charge. This is becoming part of the standard package that guests expect and demand. The cost, reliability and performance of WiFi in hotels worldwide has been a subject of frequent contention amongst hotel patrons. The most notable high-tech innovation since a few years ago has been the mobile revolution. From the tablet with the iPad to the smartphone before it, they have become ubiquitous to everyday life. According to the Luxury Institute, one-third of wealthy consumers own a tablet or e-Reader such as the Kindle or Sony. Any organization obsessed with customer service and the total customer experience, let alone the hospitality domain, should forgo routine and avoid unpleasant surprises. Complacency is a comfort zone which yields marginal performance. It can cause deficiencies, stifle growth and progress. This syndrome should be replaced with drive and consistent improvement. The culture of the organization, along with its structure, play a major role with the challenges it faces and how it deals with them. As in every service sector, with an upscale hotel, every guest contact point should offer a unique and pleasant experience. Hotel brands need to use an integrated approach across their various touch points to engage their customers – commencing from the ease of their online (website) procedure or phone reservations center, during the guest’s stay, at check-out and beyond. Sufficient resources and proper procedures should be implemented in hiring and training individuals with the right attitude over skills. The organization’s culture ought to support and inspire its staff to impressive achievement. An environment of mutual trust between leaders, employees, and customers should be created, along with proper rewards and incentives. This is what it takes for a human and personalized touch that retains its brand promise. The best managed organizations have one factor in common: They are constant achievers, exude managerial excellence and possess a well-targeted CRM. The payoff will be a higher level of repeat business, referrals and profitability. Their financial performance is reflected in those results. Ultimately, everyone in a service organization should live and breathe the brand. – Robert C. Ford, Michael C. Sturman, Cherrill P. Heaton (2011) Managing Quality Service in Hospitality. – Parasuraman, A., Zeithaml, V., and Berry, L. (1994a). Alternative scales for measuring service quality: A comparative assessment based on psychometric and diagnostic criteria. Journal of Retailing, 70 (3), 201-230. – Armstrong (2009). Armstrong’s Handbook of Management and Leadership. A guide to managing for results.